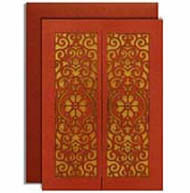 Description: An elegant looking red metallic card has a rich laser cut background design towards the sides and displaying the light yellow base below it. The card opens from the centre to the inserts inside. Inserts are made of yellow metallic card while the envelope is made of matching red metallic card.